Photograph from the Curzon Collection: 'Vist of His Excellency the Viceroy. Kotah, November, 1902'of Royal Cenotaphs at Kota, Rajasthan, taken by P.A. Herzog and P. Higgins in November 1902. The City Palace at Kota dates from the 17th century and is situated on the east bank of the Chambal river. The cenotaphs of the ruling family lie nearby, set in formal gardens. The Mughals developed the idea of a memorial garden surrounding a tomb or cenotaph known as a ‘char bagh’. This was typically laid out as a square formal garden composed of four smaller quadrants divided by axial paths. 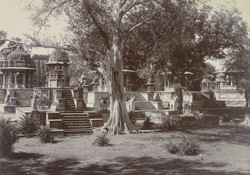 This general view shows the cenotaphs, which take the form of domed kiosks supported on columns known as chattris, elevated on plinths inset with flights of steps.